The forecast had called for rain and the skies looked to be corroborating. 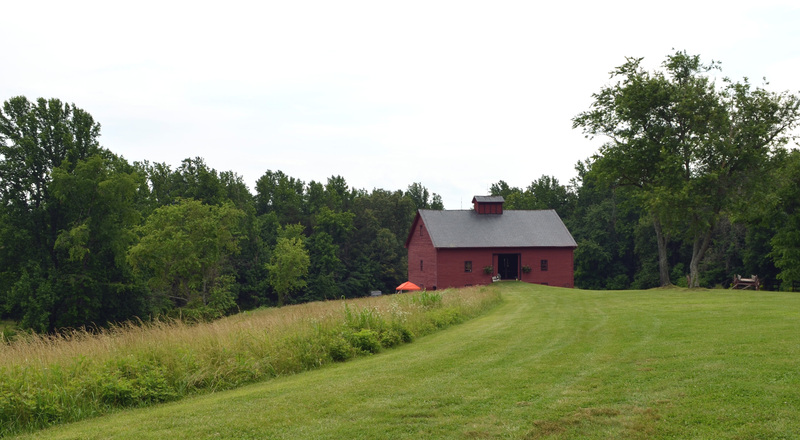 On this humid early Summer evening, the red barn in the distance beckons guests past the breathtaking and beautifully kept gardens of Belle Haven. 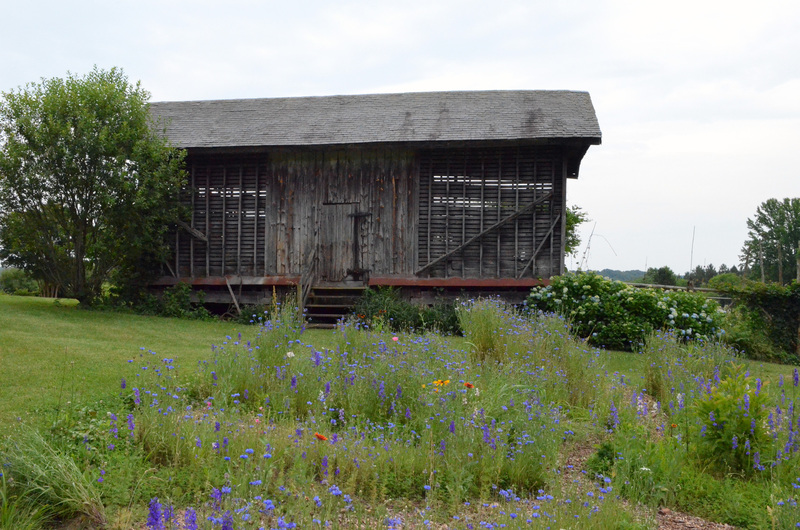 Many have already crossed the grounds to check out the barn well before it’s time to sit and eat. 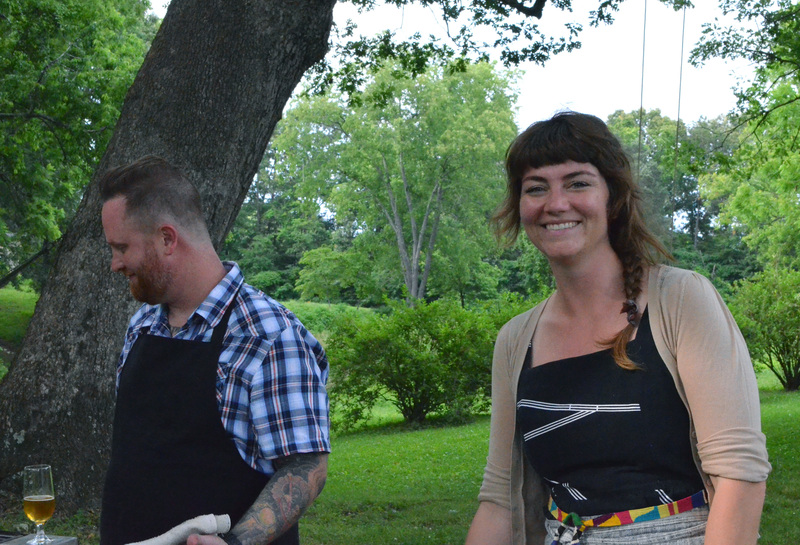 Tracey is the gal behind Hill & Holler, a “modern configuration of the farm table.” For the last couple of years, she’s been gathering regional agricultural and culinary professionals together with their community to break bread and raise funds for selected non-profit groups. 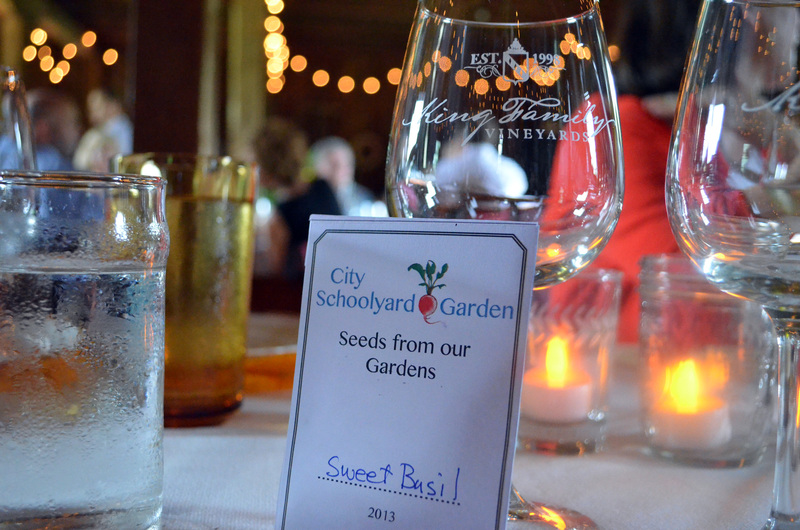 Tonight’s event in Scottsville, VA benefits City Schoolyard, a Charlottesville initiative that uses schoolyard gardens to promote experiential learning for elementary school students. 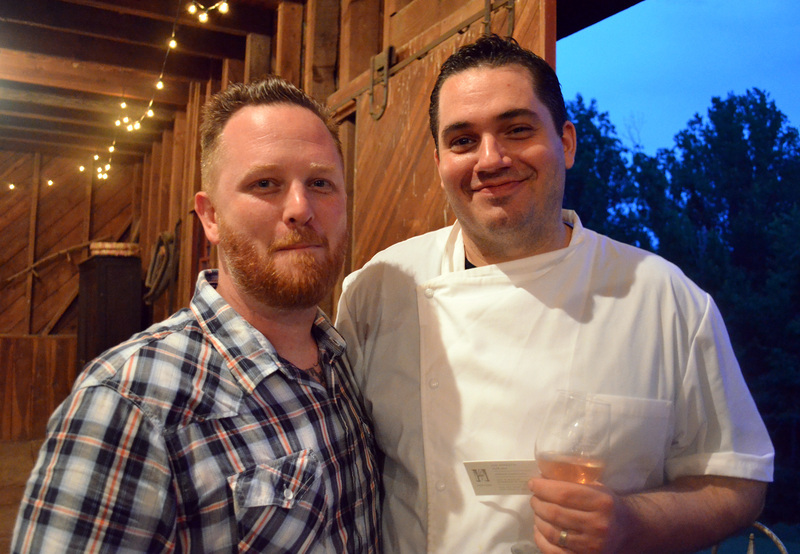 Two of our own Richmond luminaries, Joe Sparatta and Owen Lane are the guest chefs. 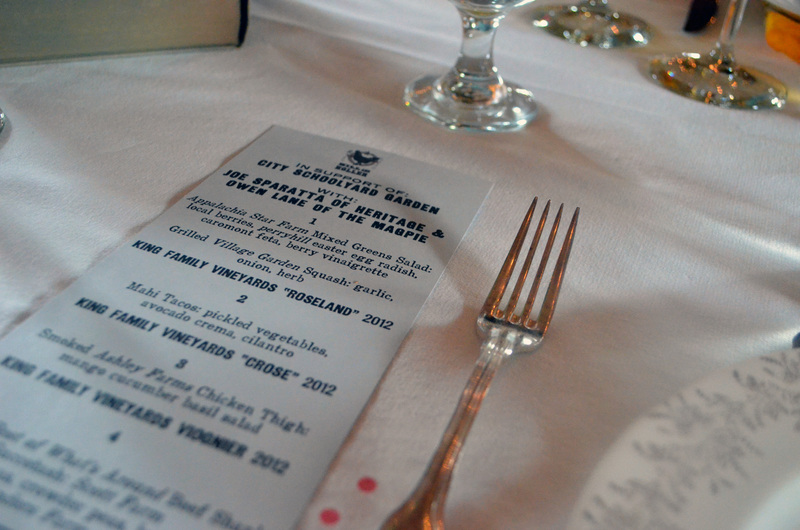 Their dishes are paired with local wines from King Family Vineyards. 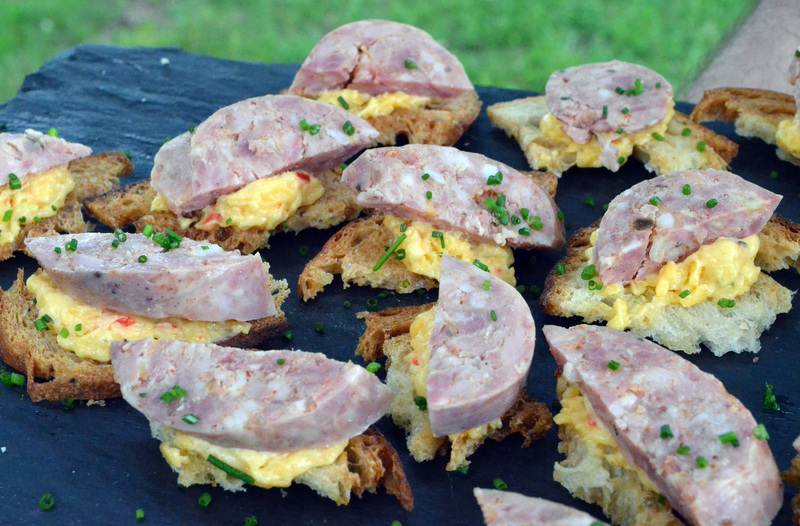 We are greeted by the sounds of Carl Anderson and Ellen Picker, two musicians from Charlottesville while hors d’oeuvres of radish with whipped lardo, grilled oysters and lamb summer sausage and pimento cheese are passed. After attending an Outstanding in the Field dinner Tracey was impressed, and sought to bring a similar event to her community. 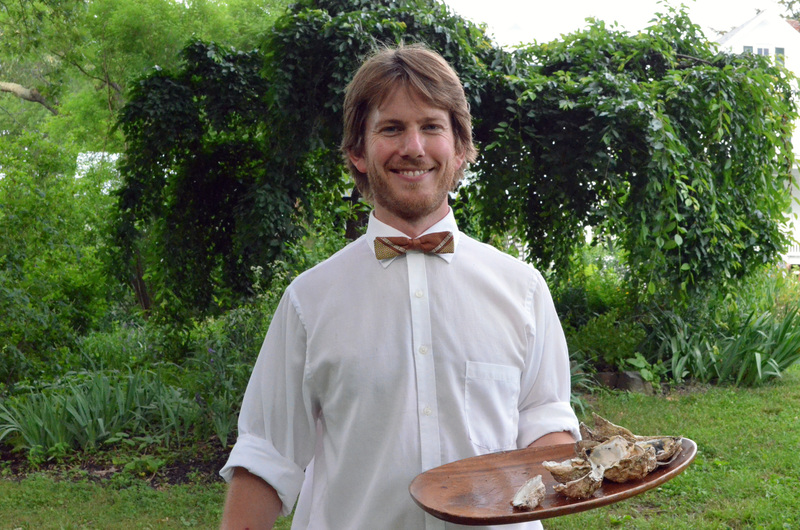 The first, a benefit for the UVA Food Collaborative was in October 2011 at Blenheim Vineyards and featured another Richmond chef, Lee Gregory. 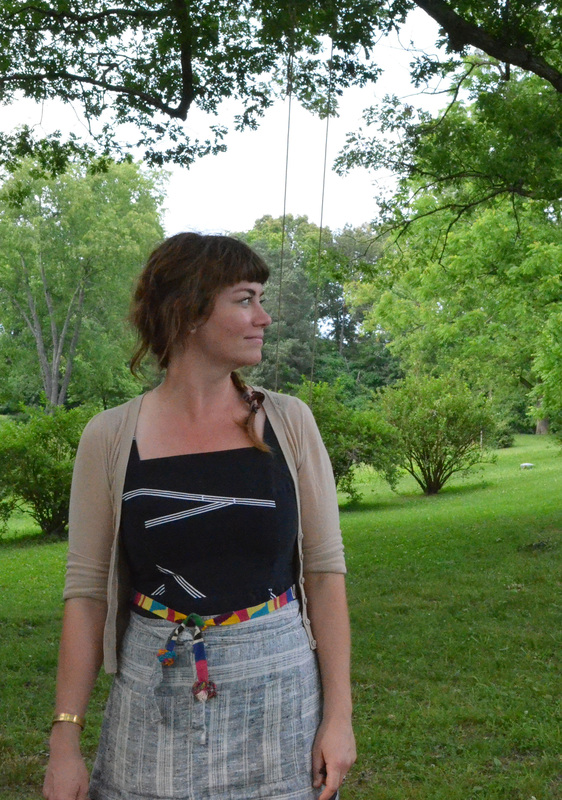 Hill and Holler is not a one woman show. Tracey explains that she enlists the help of friends to make it all happen. 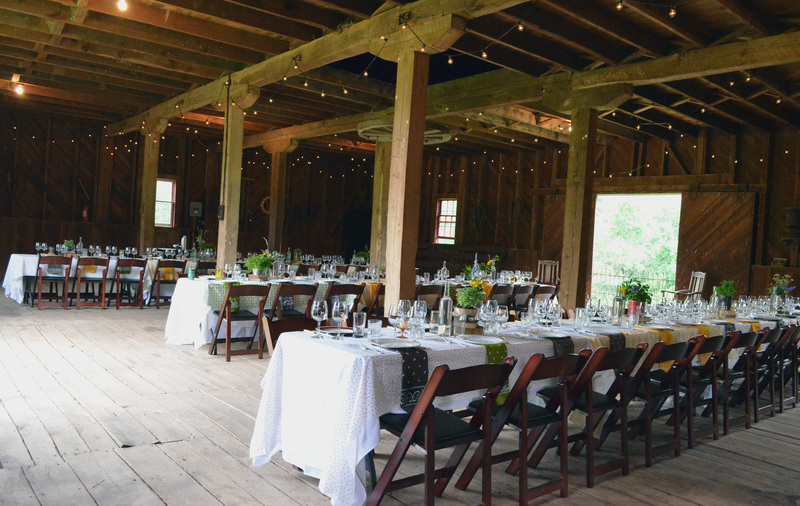 The plentiful meal is a cross section of the region’s bounty, with produce from Appalachia Star farm, Saunders produce and chicken and beef from Ashley farms and Best of What’s Around farm respectively. 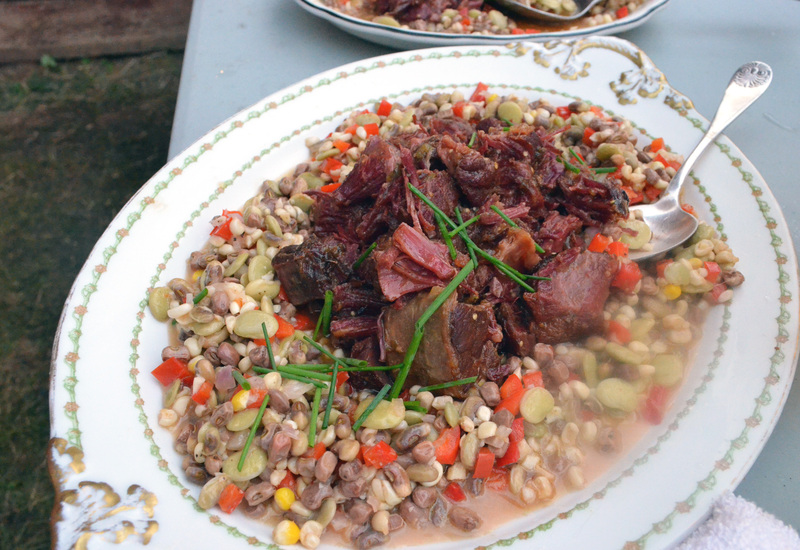 A standout for me is the incredibly flavorful beef, so moist and tender it reminds me of pulled pork. All of the food is served family style, reinforcing the idea of a community coming together to connect and share. Tracey says the most challenging part of putting on these events is logistics. One such pesky challenge reveals itself when a faulty grill attempts to throw a monkey wrench into the works, but Tracey and her staff are one step ahead of it and someone leaves to retrieve another grill on standby. I get the feeling she keeps a plan B handy and maybe even a plan C.
“Nothing about it is easy, but I’m stubborn and like to work hard and it’s always worth it in the end. Finally the weather makes good on its threats with a light but steady sprinkle. As the evening comes to a close, groups of full and happy folks begin to cluster to chat and laugh and say their goodbyes. It’s clear that Tracey has again succeeded. It, is indeed working. 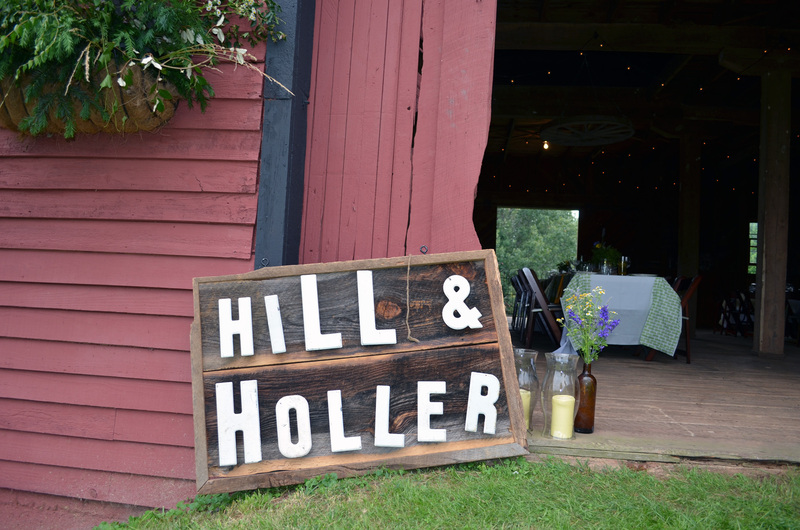 To find out when the next Hill & Holler event is happening, check their events page. 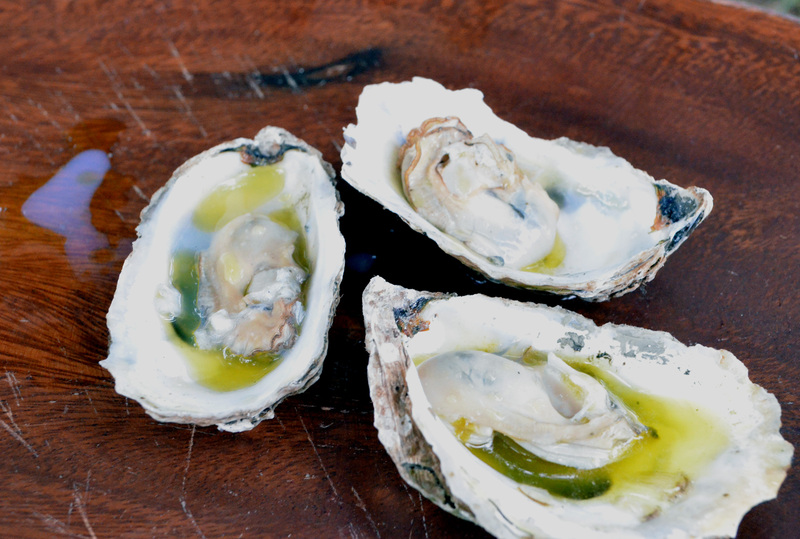 This entry was posted in Uncategorized and tagged Appalachian Star farms, Belle Haven, Best of What's Around, Blenheim Vineyards, Charlottesville, Hill & Holler, Joe Sparatta, Lee Gregory, Owen lane, Scottsville, Tracey Love, VA. Bookmark the permalink.